There are two subjects Russians talk about a lot: history and geography. In recent days, there's been much public discussion of both. Russian officials and the media have been constantly recalling "Yugoslavia - 1999", "Iraq - 2003" and "Libya - 2011" as examples of Western military intervention which resulted in regime change. The suspicion in Moscow is that the West is plotting to add "Syria - 2013" to the list. One of the headlines this week in the Russian government daily Rossiskaya Gazeta was: "Will Obama risk repeating the Libyan-Iraqi scenario in Syria?" Moscow appears now to be expecting a US strike on Syria. According to the head of the foreign affairs committee of the Russian Parliament, Alexei Pushkov: "It's only a question of time." But the Russians have not stopped arguing their case that military intervention would be wrong. First, Moscow maintains there is no proof that President Bashar al-Assad was behind the suspected chemical weapons attack in eastern Damascus. If anything, argue the Russians, evidence points to the rebels carrying it out in order to scupper peace talks and to put pressure on the Syrian government. Russia insists that UN weapons inspectors in Syria should be given time to complete their job, write up their report and present it to the UN Security Council. Next, Russia continues to warn that military intervention will have "catastrophic consequences" for the wider region, including a rise in radical Islam. This week Russia's deputy prime minister tweeted that "the West is playing with the Islamic world like a monkey with a grenade". Finally, Russia believes that any military action without a mandate from the UN Security Council would be a "grave violation of international law". 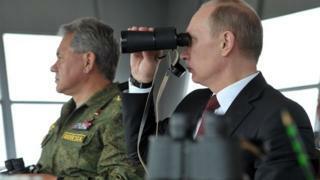 So if there is a military strike, how is Moscow likely to react? On Wednesday, one of Russia's most popular tabloids, Komsomolskaya Pravda, warned that Western intervention could spark an East/West standoff akin to the 1962 Cuban Missile Crisis. "If optimists in the Pentagon believe that Russia will limit itself to warnings and expressions of anger, like it did over Iraq and Yugoslavia, they may well be mistaken," the paper declared on its website. "Times have changed. There's too much at stake and Moscow won't retreat... Who'll crack first: Putin or Obama?" Such sabre-rattling may be exaggerated. Although Moscow has been a firm ally of President Assad, Russia is unlikely to be drawn into direct military confrontation with the West. Russian Foreign Minister Sergei Lavrov has already made it clear that his country has "no plans to go to war with anyone". But there are other ways in which Russia could display its disapproval of Western intervention and its anger with the United States. Some commentators predict that Moscow may increase weapons supplies to Damascus, forge closer ties with Iran and reduce co-operation with Washington in different areas. Relations between Russia and the West have been growing increasingly rocky. There's little doubt that Western military intervention in Syria will make an already difficult relationship even more strained.